2005 is an exciting year for the world of hobbyist show chinchilla breeders. For the first time, a select group of rare and exceptionally beautiful Royal Persian Angora chinchillas are leaving the sole breeding herd in Amarillo, Texas in the United States bound for some of the top hobbyist show herds in Europe and Asia. The Royal Persian Angora promises to add a new dimension to chinchilla breeding. Their long silky hair, along with a prepotency towards the desirable pretty heads is sure to draw much attention from breeders and spectators alike. The Royal Persian Angora will push the show standard for "eye appeal" to a whole new level. somewhere in the early 1960's, at a ranch in Ft. Worth, Texas. This mutation was observed and described by Dr. Caraway, as reported by Dr. J. Lauridsen. Dr. Caraway stated that the initial long haired mutation matured very quickly, at about 5 months of age. Fur producers at this time were interested in developing the mutation as an answer to fast production. 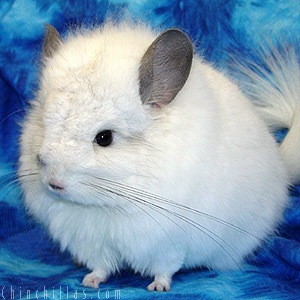 The problem with the mutation in this market was not only that the fur was twice as long as that of a normal chinchilla, but also that good clarity of color and a dark color phase proved difficult to produce simultaneously with the genetics that accounted for their rapid maturation. Dr. Lauridsen saw another example of the long haired mutation in Canada a few years later. These animals were being bred by a man of Polish decent who, like the originating breeder, eventually gave up on the mutation as a viable fur producer. In 1966, a breeder by the name of Roy Wilson began working with the long haired chinchilla when his "P4" was born showing evidence of the long haired mutation gene. Whether or not this was the same mutation as that produced earlier has not been proven from a genetic basis. However, there is significant phenotypic evidence to suggest that the same genetic mutation was involved in both cases. The most prominent observable difference between Roy Wilson's animals and those of the originating breeder, Dr. Caraway, and the Polish Canadian was that Mr. Wilson's animals did not exhibit the off- color found in the previous herds. After several more years had passed, Mr. Wilson's friend Doyle Briscoe became half owner in Wilson's long haired herd. The Briscoes successfully showed long haired carriers, and had at least one Black Velvet long haired carrier that won Champion Black at a show in Texas. The fur of this particular carrier had a fairly normal, but slightly longer, "plushy" look. The long haired mutation was never a notable success in the herds of pelt producers, but fortunately the gene was not lost forever. In April of 1997, Tamara Tucker and Pamela Biggers of Amarillo, Texas purchased the long haired chinchillas from the Briscoes. Ms. Tucker and Ms. Biggers wisely spent the next 8 years heavily outcrossing the mutation to improve size, fur quality, and heartiness, and subsequently named the mutation the Royal Persian. They produced primarily standards, and then went on to cross the long haired chinchillas with the incomplete dominant whites. It was here in Amarillo that homozygous long furs were produced with such length that the hair would actually part down the center of the back. Like the Briscoes before them, Ms. Tucker and Ms. Biggers successfully showed the long haired carriers to 1st place ribbons. It was during this past eight years that the long haired mutation was finally propagated and improved to the point that Ms. Tucker and Ms. Biggers made the decision to offer a limited numbers of Royal Persians to breeders outside the Tucker and Biggers herds. Through their association with Jim Ritterspach of R&R Chinchilla Inc. and Chinchillas.com, the first of the Royal Persian Angoras are now leaving North America to go to their new homes overseas. The modern Royal Persian Angora mutation of Amarillo appears to be a recessive gene. Most carriers look normal, but a few carriers have slightly longer, plushier hair than non- carriers. In the homozygous form, the fur is truly that of Angora type. It has also been noted that breeding Angora to Angora sometimes produces offspring with hair longer still than sire and dam. Unlike the long haired chinchillas of the 1960's, today's Angoras are not afflicted with the significant off color of their progenitors. They do not, however, mature rapidly as was noted in earlier herds. Today's Royal Persian Angoras mature at rates similar to non Angora chinchillas. The showing of chinchilla lanigera as a hobby by serious and dedicated breeders worldwide has seen a surge in popularity between 1995 and 2005. This is a group separate and distinct from consumers of the commercial pet market, and associated more with individuals who take on a serious and intent study of genetics and husbandry, and strive to produce the highest quality chinchillas possible. They are a group of breeders who find enjoyable the social and competitive spirit of showing their own breeding stock. Since the origin of the long haired mutation over 40 years ago, the Royal Persian Angora is now likely to find its most successful place in the world of chinchillas among this rapidly growing collective of hobbyist show breeders. chinchilla breeders since the first white color mutation appeared in 1955. The breeders of the Royal Persian Angoras are working to produce more Angora color mutations, as well as even longer haired Angoras. They are also contemplating making them available to US and Canadian breeders in the coming years. If you have more questions about the Royal Persian Angora, if you would like to see pictures of them, or if you are interested in purchasing, visit www.chinchillas.com. Copyright© 2004 Chinchillas.com All rights reserved. Designated trademarks and brands are the property of their respective owners.